Then, select console. After you can type a project directory or leave blank. After a last dialog, the enter the project name. The IDE will start to build the project. To test this you press CTRL+~ so the integrated terminal opens and execute the build.cmd. If everything goes well there will be an application .exe in the bin folder. I think this was because I first installed Code and run some local restore, no idea. The error is explains what to do so that was easy to fix. Next thing is to sets some paths in the task.json and launch.json; these should point to the dll in the build folder. If that’s, just set a break point and start the debugger. 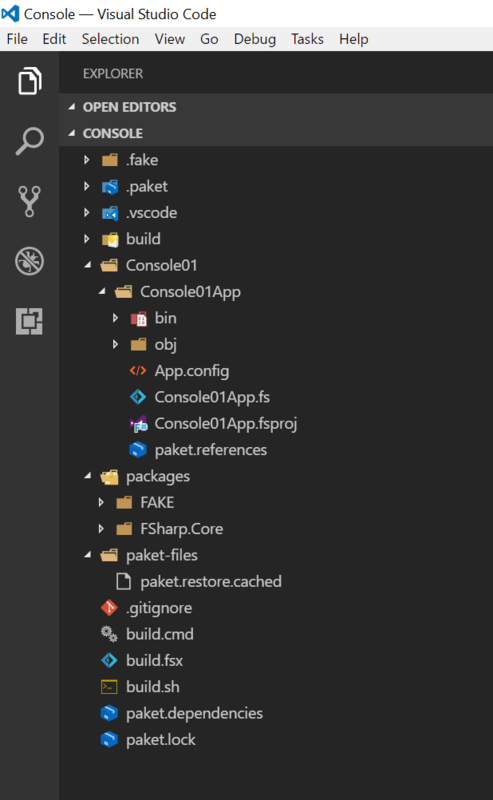 So, there is it, creating, running and debugging F# console application in VS Code!